Another interesting day on "The View" yesterday with Rudy Giuliani discussing Sarah Palin, Barack Obama, and healthcare reform. Of course he was booed when he dared mention anything negative about Obama! 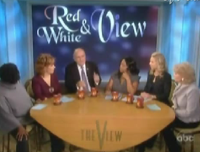 WHOOPI GOLDBERG: So, do you think [Sarah Palin] actually has a case? What is it? GIULIANI: Yeah, sure she does. GOLDBERG: I would like, I would like to know what it is. GIULIANI: I don't want to get you all, you know, down on me, but the reality is she's got a hell of a lot more qualifications than Barack Obama had when he ran for president. JOY BEHAR: Oh, come on.